New lens every day, refreshing all day. An ideal contact lens for patients who are seeking advanced comfort, especially for those who have tried daily disposable or two-week replacement lenses in the past and experienced discomfort. HPMC is often found as a primary ingredient in “comfort drops” used to relieve eye discomfort caused by contact lenses during the day. DAILIES ® AquaComfort Plus® contact lenses provide outstanding comfort by releasing blink-activated moisture exactly where it is needed throughout the day. PEG is a moisturizer used in eye comfort drops. PVA is a comfort enhancer that gives the lens outstanding hydrophilic properties, such as a very low contact angle. A lower contact angle provides better moisture coverage. These agents work in synergy to continuously lubricate the lens and deliver outstanding comfort that lasts until the end of the day. DAILIES® AquaComfort Plus® contact lenses work with the eye’s natural blinking action to release PVA from the lens, helping to maintain a stable tear film throughout the day. As you know, a stable tear film is essential for good visual acuity, comfort and a successful lens wearing experience. The moisturizing agents in DAILIES® AquaComfort Plus® contact lenses are gradually released over a 20-hour period, providing blink-activated moisture that lasts throughout the day. Built-in, single-day compliance†† helps ensure that your customers start every day with a fresh, clean lens that they throw away at the end of the day. Moisturizing agent is permanently locked within the lens. DAILIES® AquaComfort Plus® contact lenses are manufactured using a unique polymer designed specifically for single-use, compared to most competitors’ daily disposable lenses that are made from the same polymer as their weekly and monthly replacement lenses. ** Versus 1•DAY ACUVUE^ TruEye^. † Versus DAILIES® All Day Comfort, 1•DAY ACUVUE^ MOIST^, and SofLens^ daily disposable contact lenses. †† Compliance with manufacturer-recommended replacement frequency. 4 Among leading daily disposable lenses. Alcon data on file, 2010. 5 Compared to FOCUS® DAILIES® lenses; Alcon data on file, 2007. 6 In a randomized, parallel group clinical study with 291 neophyte patients who were masked to the sponsor at 26 sites; significance demonstrated at the 0.05 level; Alcon data on file, 2010. 7 In a randomized, subject-masked clinical study at 15 sites with 176 daily disposable lens wearers who were also masked to the sponsor; significance tested at the 0.05 level; Alcon data on file, 2009. 8 Wolffsohn J, Hunt O, Chowdhury A. 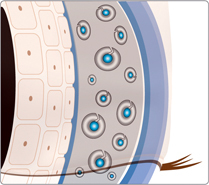 Objective clinical performance of ‘comfort enhanced’ daily disposable soft contact lenses. Contact Lens & Anterior Eye. 2010;33: 88-92. 15 Giles T, Fahmy M. Performance of daily disposable contact lenses with moisturizing agents. Optician. 2008; 6150:31-33. 16 In a randomized, parallel group clinical study with 291 neophyte patients who were masked to the sponsor at 26 sites; significance demonstrated at 0.05 level; Alcon data on file, 2010.